SETA Accreditation is the certification, usually for a certain period of time of a body or an institution, as having the capacity to fulfill a particular function within the quality assurance system set up by SAQA in terms of the SAQA Act, 1995 through the different SETA bodies. SAQA accredits all Education and Training Quality Assurance bodies also known as SETA bodies (ETQA’s) who in turn accredit Education and Training Providers to be SETA Accredited. There are a number of advantages of becoming an SETA Accredited Training Provider, including that the overall quality of education and training provision in South African is raised and maintained at a consistently high level, although the SETA Accreditation process can be very costly and long. 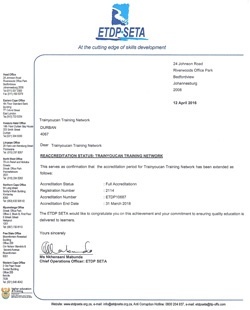 This means that the clients who use the services of that Education and Training Provider who is SETA Accredited can be sure that the Training Provider complies with the required standards for learning and assessment services. It also means that all learners can be assured of a quality learning experience and that the credits and qualifications they achieve through the education and training service will be nationally and internationally recognized, due to the SETA Accreditation process. In addition, only SETA Accredited Education and Training Providers are able to deliver education and training that leads to nationally registered Unit Standards and Qualifications. SETA Accreditation therefore provides Education and Training Providers with a valuable tool with which they can market their services to potential clients.